Dental implants are permanent replacement teeth that are mounted onto metal posts which are surgically inserted beneath the gums, into the jawbone. They are a better solution for replacing missing or damaged teeth than bridges as additional natural teeth do not have to be altered in order to place the artificial teeth. Dental implants are typically more expensive than other tooth replacement methods and most insurance companies do not cover the procedure at all, or some will pay less than 10% of the cost. Ordinary bridges or dentures are found to be extremely uncomfortable by some people and are sometimes not possible for people with poor ridges, sore spots on the gums or problems with gagging. 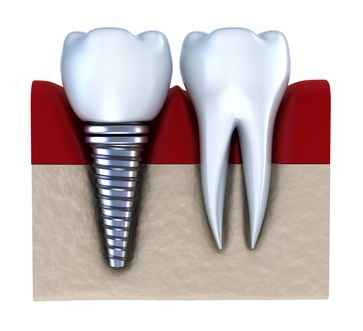 These implants are surgically inserted beneath the gum, into the jawbone and once the gum tissue has healed, a second procedure is performed to connect a metal post to the implant. The artificial tooth is finally attached to the post. A metal frame with attached posts is fitted below the gum onto the jawbone which becomes fixed to the bone as the gums heal. The posts protrude through the gums and an artificial tooth is mounted onto the posts. The entire dental implant process is performed over a period of about six months. During the first visit an incision is made into the gum and an implant inserted by placing a screw into the jawbone. Multiple implants can be inserted at the same time. After the implants are in place, the gums are sutured. The gums are allowed to heal for a period of three to six months, during which time a process of osseointegration takes place where bone will form around the implant. Temporary crowns are installed to enable you to speak and eat normally, and for aesthetic reasons. Once the gums have healed, an abutment, which serves as a base for the artificial tooth, is placed and an impression taken for the creation of the permanent tooth. The impression is sent to a lab where a custom made artificial tooth will be created. The last step of the process is to complete the restoration by permanently attaching the artificial tooth to the post. It will take some time to get used to the feel of the implant, but soon it will feel quite natural and fit in perfectly with your natural teeth, effectively restoring your smile to what it used to be. Mini implants are half the size of normal dental implants and are used when the space for the implant is very narrow. These implants are mainly used to install full lower or upper dentures. A series of small implants placed along the gum line serve as the base for dentures to be attached to. Because of their size it is often unnecessary to make an incision into the gum as they can be inserted through the gum, eliminating the time for recovery and making it possible to do a restoration in one visit, or after a short period of healing time. The process is less expensive than regular dental implants, however, they are not suitable for everyone. Dr. Lamb will know whether regular or mini implants are the right option for you.